The Windows registry files include some of the most important files and entries of the entire operating system, and if you want to deactivate one of these commands or modify something in the registry files, it is better to have an application like Registry Flashlight Fixer to be able to do so without having to worry about mucking up, something that could have catastrophic results. 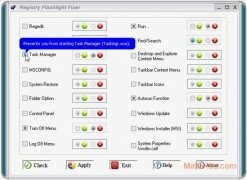 Registry Flashlight Fixer allows you to modify 18 options that have to do with the registry files by simply selecting them, which makes it very difficult to make a mistake. Among the options available you will be able to find the possibility to deactivate the “Run” command, the registry file editor, the control panel and the Windows menu. 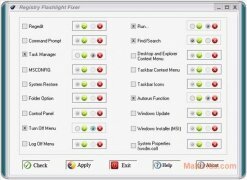 To be able to undo these changes it is only necessary to change the option you have chosen in the application, which allows any user to carry out these changes, even when they don't have any experience, which is very useful. 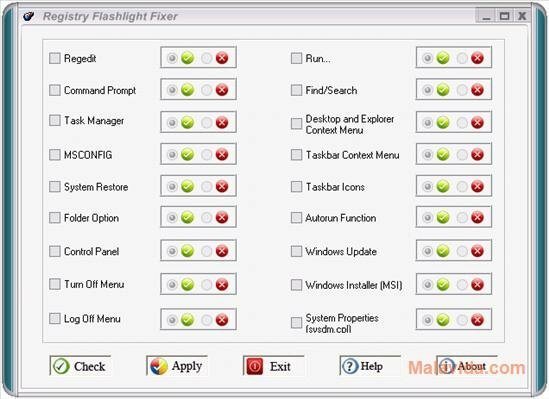 Therefore, if you want to have control over a large amount of the elements that form part of Windows by modifying the registry files, download and install Registry Flashlight Fixer, it is free. 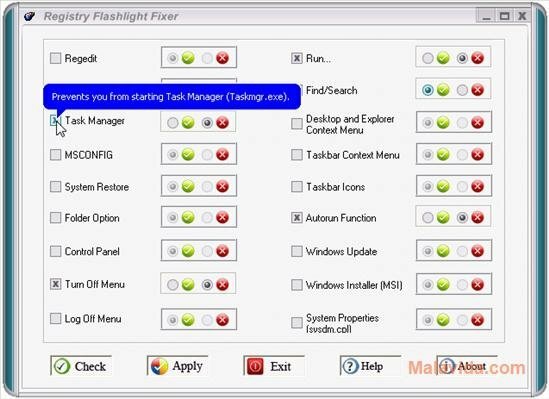 It only works on Windows XP.